Thank you for your interest in our 200 hour yoga teacher training program for 2019! We are delighted to share our knowledge and love of yoga with you. This program is for current and future teachers and for all seekers looking to travel further on their yogic path. Yoga Bhoga is a registered yoga school (RYS) with the Yoga Alliance (the governing body of yoga certification). Our 200 hour program is designed to deepen your practice and give you the tools to teach others. Completion of this program is a wonderful accomplishment. At the same time it's only the beginning -- we can't possibly teach you everything we know in 200 hours. The practice of yoga is a lifelong endeavor full of learning and realization at every turn. Alongside the theory and practice, you'll open more fully to your life, creating a stronger community by learning to see and communicate connectivity on all levels – physical, emotional, mental, intuitive and spiritual. Develop a clarity of intention and authenticity that is grounded in the practice of svadyaya (self-study). Go deep with a consistent study of asana, pranayama, and meditation to further your skill and awareness in your own practice. Discover how yogic teachings and philosophy are relevant to you today, and how delving into these ancient practices can create deep personal transformation. Learn the foundations of anatomy specific to yoga practice. Study clear asana alignment based on an anatomical understanding of the body. Practice intelligent sequencing that gives you the tools to design safe, effective yoga classes suitable for any student. Build and refine skills of communication, knowing and speaking to the student in front of you with grounded clarity. Learn and appreciate the ethics of the teacher / student relationship. To help you master this material, we also provide each student the Yoga Bhoga Teacher Training manual. This manual contains hundreds of pages of summaries and explorations covering the key teachings and also includes an extensive collection of fully annotated posture photographs. You'll add your own insights and realizations to this throughout the program resulting in a priceless and one of a kind resource you'll refer to for many years after the program. You must have a regular yoga practice of at least one year with moderate proficiency in the following postures: Urdhva Danurasana, Adho Muka Vrksasna (at the wall), and Sirsasana A (at the wall). Issues that arise from injury, structural issues, or a specific medical condition are workable. The intention is to determine your overall ability. If you are very new to the practice of yoga, it's not the right time to dive into the details. Don't worry, there's no rush - simply practice more and come back next year! If you are interested in applying to our yoga teacher training or wonder if it might be right for you, fill out the application and contact Meghan at meghan@yogabhoga.com. Meghan teaches a traditional style of Hatha Yoga with a commitment to teach yoga for its original and true aim: to go beyond our perception of whom we think we are and realize the infinite potential within. Her classes consist of 3 fundamentals: asana, pranayama, and relaxation. Through proper alignment in asana (steady posture), breathe awareness through pranayama (the control and expansion of one’s vital force) and proper relaxation in a meditative atmosphere, the student is part of a unique practice that is unlike contemporary yoga classes. Meghan interweaves yoga philosophy and subtle body awareness to aid each student in maintaining focus while deepening the benefits of the practice. Her students describe these classes as inspiring, humble, graceful, truthful, challenging, and full of heart. 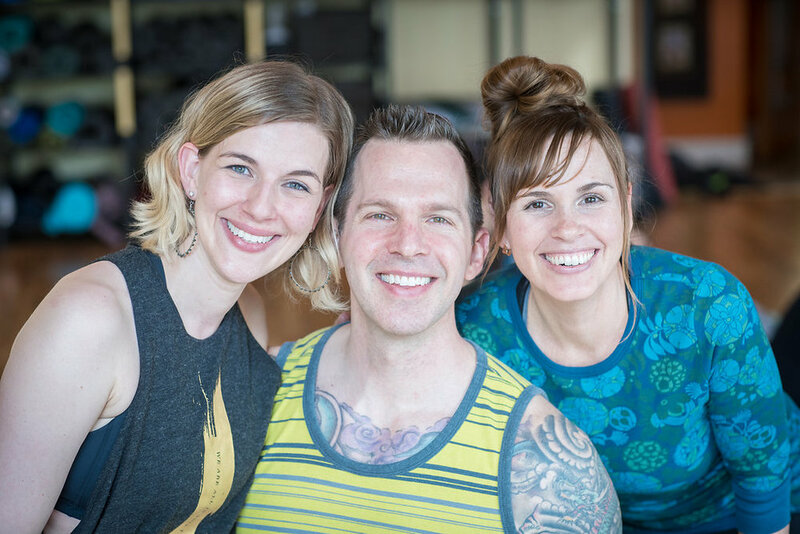 Scott Lennartz is a local Portland product having studied with Denise Payne and Lisa Mae Osborne and is the owner of Yoga Bhoga. Scott likes teaching classes that help his students feel good and leave happy. This often means sweating, losing your balance, and trying challenging poses while laughing. Scott is a huge yoga nerd and loves the detail and mystery of the practice. He believes yoga has the power to help us in the here and now, to be connected, kind, and joyful. Krista Loveless is a native Portlander with a strong east coast influence. Her passion is to help people become autonomous in their body and has over 20 years of teaching movement as a dancer, PMA certified Pilates Instructor and Yoga Bhoga 200 hour graduate. In 2015, she received her Masters in Motor Learning and Control from the Teachers College Columbia University biobehavioral sciences department. 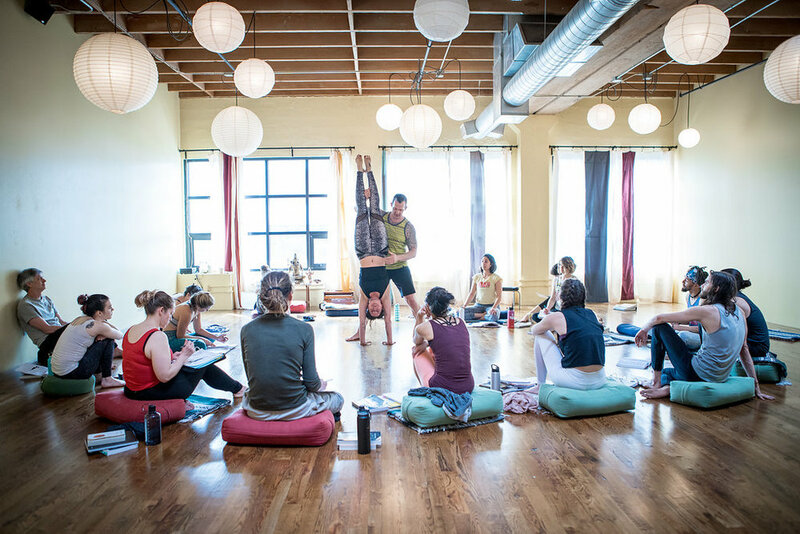 The program reignited her passion for helping teachers refine their skills and hopes to bring a new outlook on teaching movement to the Portland Yoga Community. The cost of tuition is $3200 ($300 discount when paid in full). This includes all instruction, printed materials, unlimited classes at Yoga Bhoga, and the three night retreat at Breitenbush. Payment plans are available. Please note tuition does not include the cost of text books.